Click on photo to learn how, on its birthday, Occupy Homes is escalating its struggle for housing justice. One year after their successful defense of Bobby Hull’s house in South Minneapolis, Occupy Homes Minnesota demonstrators have escalated the bet by launching a high-profile new campaign that they hope can solve two persistent problems with the same remedy: Moving the homeless and those who lost their homes through foreclosure into abandoned properties. Their campaign will focus on making a “foreclosure free zone” in Minneapolis’ Powderhorn and Central neighborhoods — two areas hit hard by the housing crisis — and home to many of the thousands of abandoned houses in the Twin Cities. It is both daring and risky, and could lead to an eventual confrontation with city police. On Thursday, December 6, nearly 200 housing justice activists held a spirited rally at Hull’s house at 3712 Columbus Avenue and then marched five blocks to 3915 Portland Avenue, where they began occupying a vacant property in solidarity with John Vinje, an Occupy-backed homeowner who was evicted from his suburban Minneapolis house earlier this fall. Police spokesperson William Palmer confirmed they knew about the march, but that no incidents were reported. A few famous faces in the world of politically-active hip-hop music graced the demonstration. 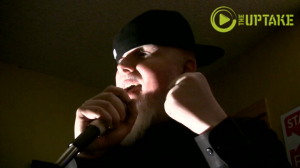 Chuck D from Public Enemy rallied the troops at Hull’s front door, and Minneapolis rapper Brother Ali performed a house concert in Hull’s living room. Occupy’s strategy to turn the Powderhorn Park and Central neighborhoods into a foreclosure free zone and move evicted homeowners into abandoned houses represents a major escalation in their housing justice fight — both practically and politically. Hundreds of people carried signs and wore "Raise the Wage" T-shirts in the State Capitol, dancing while Brother Ali sang and established a tone of jubilant expectation for a rally calling on Legislators to raise Minnesota's minimum wage. Lender Freddie Mac put the foreclosed Cruz house on the market following a heated battle over the home early this summer between Occupy Homes activists and Minneapolis police and Hennepin County sherifs officials.